As 2007 draws to a close, it’s a time for remembrance of things past. The last year has been a pretty good one for all things gadgety, so let me take this opportunity to wax self-involved and take a look at the handful of gizmos that have made this year a deliciously potpourri of technology (note: please do not eat the potpourri. It is there for its pleasant smell, not for snacking). So on this year's final Gadgetbox, we’ve got my favorite way to waste time on the weekends and evenings, a handy device for food preparation and theft deterrence, plus the perfect way to capture those fond memories of cooking…and theft deterrence. I acquired my first and, for many years, only video game console when I was around eight or nine years old. The Nintendo Entertainment System is widely considered one of the best video game systems—nay, one of the best inventions—ever devised by human ingenuity. Ever. In the world. It really was a shame that I was so terrible at most of the games. Until this year, the still-functioning NES remained sovereign on my TV stand, its select cadre of games mostly unplayed expect for the occasional trip down Nostalgia Boulevard. But at the end of April, a new contender joined the fray: the Xbox 360 Elite—my second gaming console. Hey, it only took eighteen years or so. 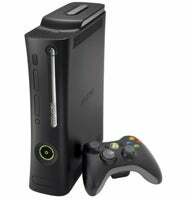 In a year that was frequently dominated with talk of the Wii and PlayStation 3, the slightly more venerable 360 was sometimes lost in the hustle and bustle of the console wars. But among the three, it is undoubtedly the most established, boasting an impressive catalog of next-generation titles and far and away the best online service (despite its $50/year fee). It’s little surprise to me that three of the top five games on Time’s Games of the Year list are 360 exclusive games, and that an Xbox game also walked away with Game of the Year from the New York Times. Will more challenges to the 360 arise in 2008? No doubt, but I feel that the console is just hitting its stride. And, for the moment, between Halo 3 and Rock Band, there’s no other system I’d rather have hooked up to my rather pathetic 27” Sony CRT. Well, as long as I can keep my NES there too—you know, for street cred. Stick it. Stick it good. Even geeks and gadget-lovers have to eat and technology can help you feed yourself something delicious, instead of having to rely on the likes of instant ramen, Cheetos, and macaroni and cheese (not that those aren’t delicious in their own right). And it’s not all microwaves, refrigerators, or even toasters that make your kitchen a technological marvel. It’s other simpler things, too&mdash;things that don't need to be plugged in or recharged. 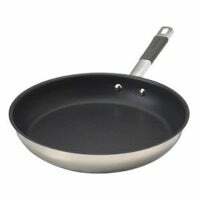 Take, for example, Farberware’s 12” Millennium non-stick skillet. A skillet? you say. Indeed! Have you ever tried to cook an omelet on a non-non-stick skillet—a stick skillet, if you will? Not so easy, is it, buster? It’s a disaster waiting to happen, like Michael Jackson's career of recent years. But non-stick skillets make your life terribly easy. Perhaps even too easy. Eggs, stir fry, even the occasional grilled cheese&dmash;easy peasy. Oh, sure, you could cook other things too, but that would require knowing how—sadly that knowledge doesn’t come parceled with the skillet. But, on the upside, it’s still hefty enough to dispatch any unwanted intruders. In a non-stick fashion, of course. Of course, what’s a year without pictures? Aside from, oh, 1472. Which is probably about half the number of photos I’ve actually taken this year. After suffering through the majority of the year with my ancient Canon PowerShot A510, I decided to make a jump to the next level: holographic picture taking. 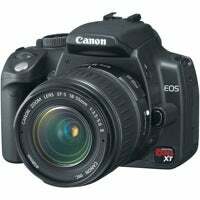 Or, okay, a Digital SLR. I’ve only had my Canon EOS Digital Rebel XT for about a week now and it’s already achieved a hallowed place in my pantheon of gadgetry. It's also elicited plenty of ooh’s, ahh’s, and oh-god-don’t-point-that-at-me-or-I’ll-tear-your-head-off’s. Turns out that people don't like flashes exploding into their faces every fifteen seconds. But the way I see it, art requires suffering. Preferably not my suffering, of course. While the XT may not have the most megapixels you can find on the market, it’s light, not terribly expensive, and it feels like a real camera. The holidays are a perfect time to break it in, too. I’ve taken a couple hundred pictures in just the past few days and I love the depth of field and image quality that the XT brings to my snapshots. Looking forward to 2008, I’m anxious to see how it fares in all of my assorted trials and tribulations. Trip to CES? No problem. Macworld Expo? Suuure. Family vacation? As long as it doesn’t end up in the lake, I’m good. These aren’t the only gadgets that have played a part in my life this year. You’ll notice a certain phone/iPod/Internet device appears nowhere on the list, despite the fact that it had a significant role in both my personal and professional life in 2007. But come on, that’d just be obvious. We don't do obvious here at Gadgetbox; that's the last thing we want. What lies ahead in 2008? Bigger, faster, and better, no doubt. But the flashiest gadgets aren’t always the ones that we have the closest connections with. Although let me be the first to say that I’m hoping for jetpacks, teleporters, flying cars, and the toaster to end all toasters. See you next year.